Military chaplains are expanding the scope of Covenant ministry. Five women share their stories. Women in ministry have been shifting the church’s image of pastoral leadership and are answering the call to serve in a wide variety of contexts. 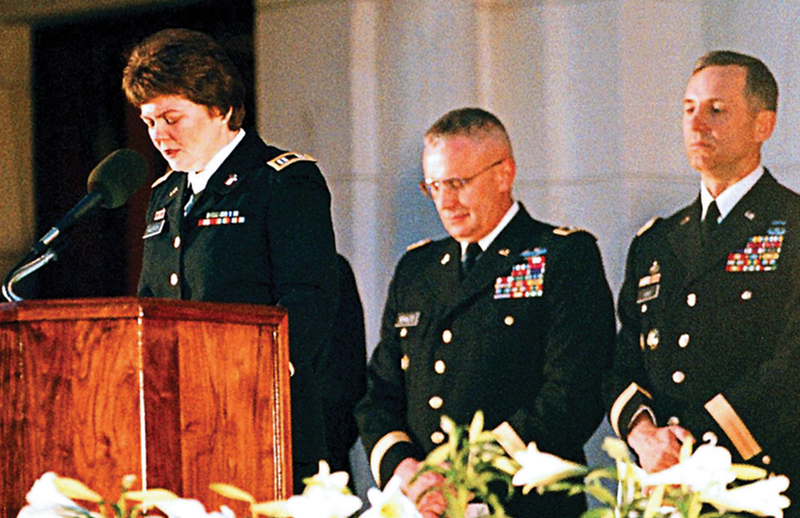 Thirty years ago, the Covenant endorsed a woman as a military chaplain for the first time. Women have been following this unique call ever since. Soldiers often don’t know how to react to me. From privates just out of basic training to colonels with twenty years of military service—when I walk into a room, more often than not, I get that look. They’ve never seen a female chaplain before. Of the approximately forty chaplains stationed here at Fort Drum, New York, only two are women. Being a female chaplain can be very isolating. If fellow chaplains hold to a theology that does not support women in ministry, they may avoid interacting with us. So it’s very important for me to have female colleagues with whom I can find support. Sometimes, however, I am the only woman around. One year I was deployed to Djibouti at Christmas. All of the soldiers under my care were on the same base. Another chaplain served three different locations, and it was impossible for him to lead Christmas services at all three places so he asked me to do one. It happened to be an infantry unit with only males—two hundred men and me. I led a candlelight service outside in the dark under the stars. There was something moving about leading that group of men singing “Silent Night” and sharing the whole Christmas story leading into the gospel. It was a powerful and humbling experience. One soldier said he had never heard the story like that before. I sensed God calling me to become an officer. 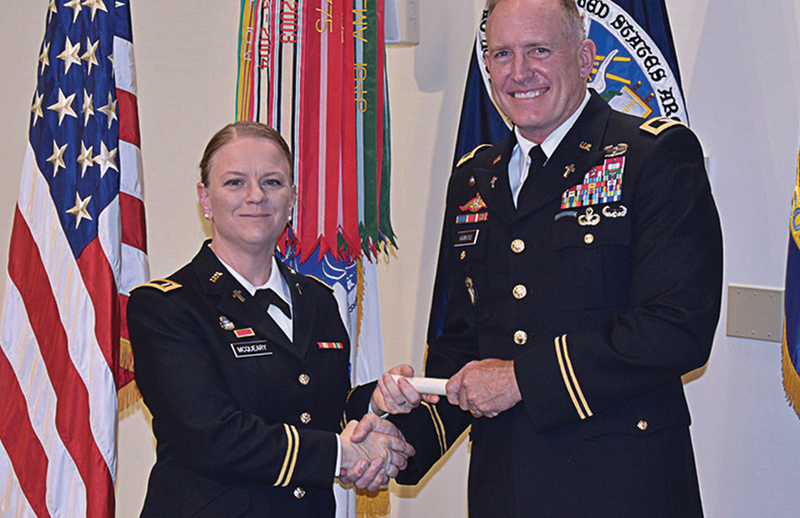 To be commissioned as an officer requires a bachelor’s degree, so I joined Reserve Officers Training Corps (ROTC) and transferred to the National Guard. Senior year I wrestled with what direction God was leading me in. After praying about it, I heard God say, “Chaplain.” I thought, That can’t be right. God must not be listening to me. Later in the week my mentor at the time asked if I’d considered being an army chaplain. And a few days later I picked up a magazine and on the back was an ad for army chaplains. I realized I’d better look into this. After researching what it would take to be a chaplain, I felt affirmed that this was my call to ministry. I enrolled at Fuller Seminary at the Phoenix, Arizona, campus in 2007. When it was time for my internship, I connected with a professor who was familiar with the Covenant and knew that they supported women in ministry. I did my internship at Paradise Valley Community Church, a Covenant congregation in Phoenix. That church felt like home and played a huge part in my growth as a pastor. I was ordained this past June. There is a mosaic of theological beliefs among military personnel-—Christian, Jewish, Muslim, Buddhist. If I am unable to meet their religious needs because of the theological beliefs of my endorser (the ECC), I find someone who can. Serving in a diverse climate is both a challenge and a blessing. It strengthens my faith to wrestle with my own theological stance. I am able to engage with soldiers who would never step foot in a church but are willing to come to me for pastoral care. I am able to engage with soldiers who would never step foot in a church. I grew up in a military family. My dad retired as a colonel in the National Guard. We didn’t have to move in the Guard—I lived in one house my whole life, so I didn’t have that stress as a kid, but my dad was often gone, so I understand some of the stresses that military service can put on a family. My husband, Cody, is in the US Army Reserves, but since I am in full-time ministry as a chaplain, we move wherever I am stationed and he finds a new reserve unit. In my second year of marriage I was deployed. I was gone for eleven months. It is an honor and privilege to serve soldiers and their families, but sometimes it is a challenge for me to be a chaplain in the military. I must work through feelings of isolation. Some days are simply lonely, but I know I am not alone because God is with me and he sees my loneliness. Whenever I start doubting my call or wonder if I am doing anything right, God reminds me how much he loves me and that he is the one who called me. Growing up, I was surrounded by veterans. My dad and his brother served in the US Navy. Their dad, a first-generation American from Poland, served in the US Army. My maternal grandfather served in the Navy, as well as many others on that side of the family. Today I have nephews who serve in the Navy and the Air Force, and I eventually married a navy man whose family also held a long tradition of US military service. As an army chaplain, I am not only the first pastor in my family’s history but the first female military member. I serve with the 814th Transportation Battalion, a United States Army Reserve unit based in Boise, Idaho. I live in Oregon, Ohio, where I am senior pastor of Fireside Church, a Covenant congregation. After high school I thought about joining the military, but instead I chose a less healthy path. Although I felt called to ministry at five years old, I was raised to believe that God does not call women. After I made some mistakes and bad choices, I never believed I could be a pastor. But God challenged me to serve soldiers who quite often are experiencing immense moral injury. I love hands-on ministry, getting into the dirt of life to bring hope and healing. Being an army chaplain provides a ministry setting that takes me outside of the typical church venue and also allows me to follow in the steps of the amazing men in my family. A chaplain’s duty can be summed up in two words—provide and advise. We provide religious support to soldiers and advise commanders on ethical and moral implications of their decisions. A chaplain’s duty can be summed up in two words—provide and advise. As an army chaplain, I sit with soldiers who will be deployed and who face the reality of death in ways that most average people do not. I help prepare them by teaching them to live well and love well. Our highest calling is to love God with all that we are and to love our neighbors as ourselves. Who better to love, care for, and serve than those who daily are willing to lay down their lives for others? I was working as a hospital chaplain assigned to a behavioral health unit. There I met many veterans who were struggling with post-traumatic stress disorder, moral injury, and various other mental health issues, mostly related to their service experiences. I saw that once symptoms begin, it is a long journey to healing and many become chronic patients at the hospital. I wanted to find a way to help contribute to preventing those situations instead of just working for treatment afterward. Hospital chaplaincy trained me to minister to everyone regardless of faith, race, ethnicity, age, gender, sexual orientation, or any other difference. I had to learn how to minister to people with faith or no faith, denomination or no denomination. I learned how our body, mind, and spirit are connected and impact our life, especially regarding health. I spent countless hours with people preparing for their good death, and it was very rewarding. However, I also wanted to spend more time with others to contribute to a good life before their good death. 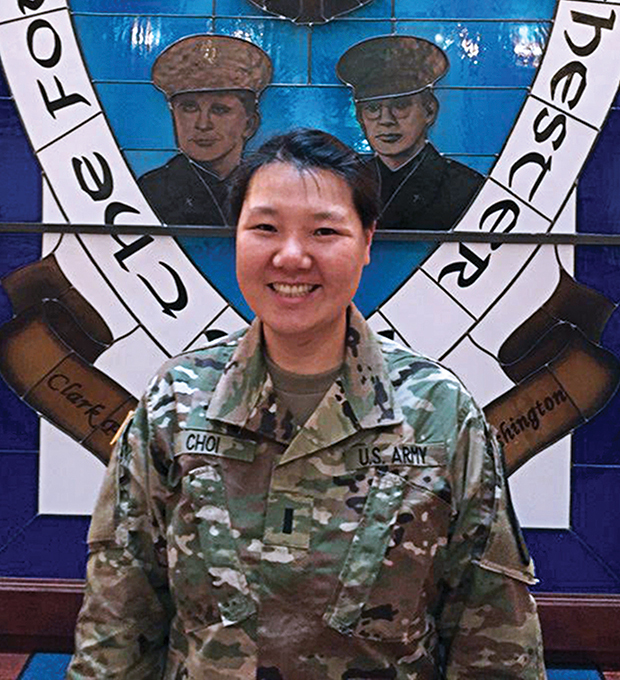 When I became a chaplain in the military, friends and family worried about how demanding the physical training would be and how I would experience the male-dominant military culture as an Asian woman. When I had my senior chaplain interview, the interviewer kindly commented that I would face many stereotypes, some positive and some negative. Overall, I have received support for my decision, including from my father and brother who finished their mandatory military service in Korea. They have encouraged me continuously and have supported me in every possible way. I leave for my first assignment this fall and I am grateful to be adding more diversity to the military culture, especially as an ethnic minority female chaplain. Being an army chaplain was not on my list of things to do. I was preparing to be a missionary in another denomination when they began to have funding issues and told those of us who were prospective missionaries that we should find something else to do. I kept encountering the suggestion of military chaplaincy and thought it was a wild idea. I had my MDiv and was working at Covenant Trust Company when I sensed God speaking to me about it. I was a little afraid that I’d get a commanding officer who would eat a female chaplain for breakfast, but I decided to step in and see where it led. I learned that chaplains do a lot of counseling. As soon as I encountered a group of soldiers, my calendar would fill with appointments. I easily had forty counseling sessions a week on everything from financial issues and legal problems to marriages falling apart. This is a ministry of presence. Wherever the soldiers are, that’s where an army chaplain goes. That may mean hanging out at the motor pool, the office, and work bays, or participating on a twelve-mile ruck march over hot, rocky terrain with a heavy backpack. Overall I didn’t encounter much resistance as a woman chaplain, but there were a few challenges. In the first unit I served there was an officer from what we called the “brown shoe” army—going back to the Vietnam War era, uniforms included brown shoes. This man was at the end of his career and he had a hard time accepting me. I eventually had to refer him to another chaplain. This is a ministry of presence. In my second unit, in Korea, a young soldier stopped attending services altogether because he believed that women should not be chaplains. I felt bad that he wasn’t in church because of me. I had to talk to God about it and find my own peace. At one point, however, I became aware that the Taliban had placed a price on my head—they were angry that I was attending those meetings, just as they were angry about Afghan girls attending schools. I asked my commanding officer if I still needed to attend, but he felt the religious representation was important. So I continued to go despite the ongoing threat. I was on active duty for twenty-one years in Oklahoma, Kentucky, Hawaii, Korea, and Germany. I was deployed to Afghanistan while serving in Hawaii. Each assignment was different, so every few years I had to adapt and learn new skills and ways to provide ministry in a very fast-paced environment. I found the Army a great place to minister and I would recommend army chaplaincy for women. After my first semester in the Reserve Officers Training Corps (ROTC) at Texas A&M, I wanted to join the Army. I wasn’t sure what job I wanted to do, so I went to goarmy.com and started looking through the career opportunities. On the website I found chaplaincy and I was drawn to the idea of having a job where my sole purpose is to serve soldiers. In a profession that often must engage in war, I wanted to bring the love and peace of Christ to soldiers. In May 2015, I was commissioned into the US Army as a second lieutenant, and since then I have been training to become a chaplain. Currently I serve in the Army Reserve as a first lieutenant chaplain candidate. I have duty one weekend a month at a reserve center in Aurora, Colorado. I am still in school and hope to graduate from Denver Seminary in December with a master of divinity with a concentration in chaplaincy and a certificate in pastoral care. Army chaplains are responsible for advising their commander on morale, emotional well-being, and spiritual fitness of their soldiers in addition to implementing the commander’s religious support plan by performing or providing religious, spiritual, and moral support to soldiers. 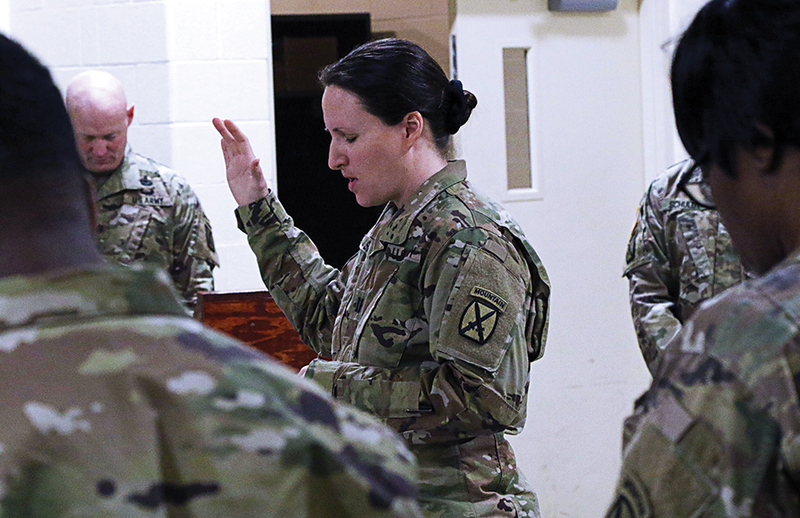 Army chaplains are assigned to units, giving them the ability to offer a ministry of presence. When soldiers are on a mission, so is the chaplain. If they are on a ruck march, so is the chaplain. The biggest challenge many women face in any kind of chaplaincy is finding a denomination to ordain them. The biggest challenge many women face in any kind of chaplaincy is finding a denomination to ordain them. I know of many women who have received the call to become a chaplain, yet the church that they have attended for years will not support them. That’s how I became affiliated with the ECC—I needed to find a denomination that would support me. I met pastor Win Houwen at our alma mater, Texas A&M, in a chance encounter during a celebration of forty years of women being in the Corps of Cadets. I was in the process of applying to become a chaplain candidate in the Army, and the last thing I needed was a denomination endorsement. She helped me find my first ECC church when I moved to Colorado. I attended Centennial Covenant Church in Littleton for three years and was a youth group intern while I was there. Female chaplains are not rare, but we are largely outnumbered. Last summer I attend the Army Chaplain Basic Officer Leadership Course. Out of ninety students, there were ten females—the most women they have had in years. My husband, who is an active duty infantry officer, is my number one fan. He is my biggest support and encouragement. Our families are also very loving and encouraging. I have been blessed by the support of professors and friends at seminary and the pastors and congregants of Centennial Covenant Church. The ECC began ordaining women in 1978 and endorsed the first woman for military chaplaincy ten years later. Today there are 34 endorsed Covenant military chaplains, four of whom are women in active service. Chaplains are required to have a graduate degree in theology, be credentialed and endorsed as a qualified leader by their denomination, have at least two years of ministry experience, pass a physical exam and security check, and undergo military training before they can take the oath of office. Thank you for your article on “Serving those who Serve.” I looked for the name of the trail blazer, Anne M (Stevenson) Krekelberg, but didn’t see her name (unless I missed it). She spent 20 years as a Navy chaplain. 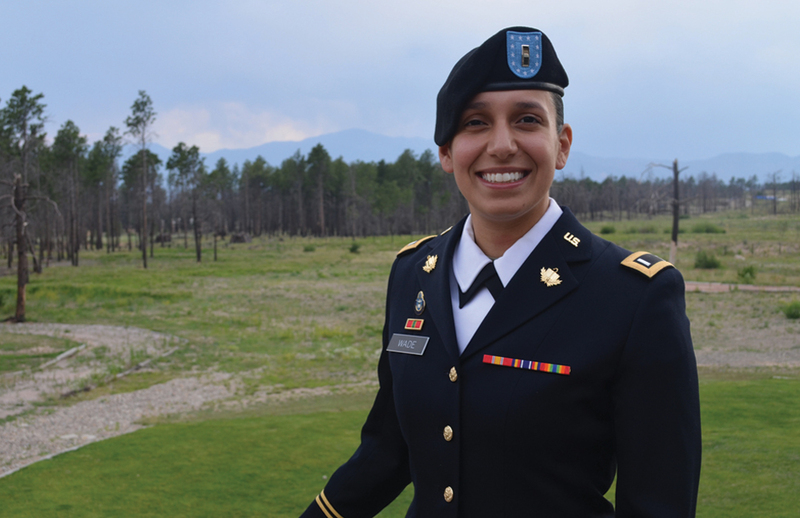 I’m proud to call her my friend and salute her for “providing and advising” our soldiers!